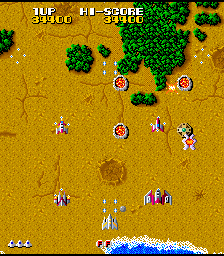 Terra Cresta is an arcade game that was released by Nichibutsu in 1985. 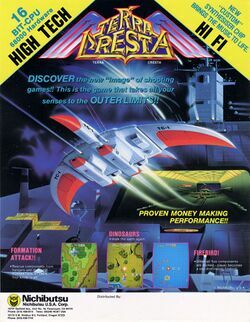 It is considered a follow up to their much older game Moon Cresta, which was released in 1980. 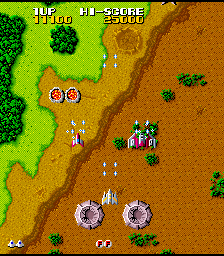 Just as Moon Cresta improved upon the Space Invaders formula by providing multiple ship parts that enhance the player's firepower, Terra Cresta provides the same improvement to the vertically scrolling shooter genre created by Xevious. As the player proceeds through the game, it is possible to reveal and collect five different ship parts. These additional modules may either fly in formation around the player, or can combine with the player's ship to form a larger, more powerful ship. Each ship piece has its own unique attack, and each formation (based on the number of collected ships) has a different attack as well. 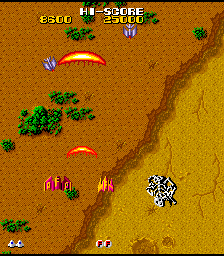 If the player manages to survive and collect all five parts at the same time, he or she can temporarily transform into a blazing invulnerable Phoenix and crash into enemies. Home conversions of the game appeared on the NES, Commodore 64, Sinclair ZX Spectrum, and the Sharp X68000. 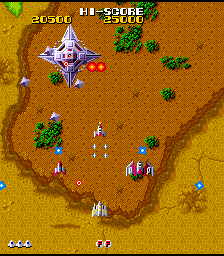 It had three follow ups, Terra Force in the arcade, Terra Cresta II for the TurboGrafx-16 and Terra Cresta 3D for Sega Saturn. Joystick: Press the joystick in any one of eight directions to maneuver the ship across the screen. You can travel throughout the extent of the screen, which automatically scrolls upward. 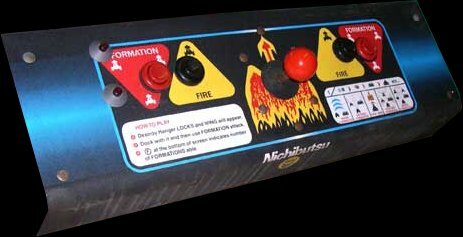 Fire: Press the fire button to fire your weapons. Which weapons you fire is dependent upon which ship parts you have collected and whether you are unified as one ship or spread out as a formation. Formation: Press the formation button to break your ship parts apart into specific formations, or to recall them back to your main ship to combine into one craft. You begin the game with the most basic form of your ship. As the initial component, it is naturally the weakest, but by no means defenseless. It can move rather swiftly across the screen, and it is capable of firing twin lasers from the front mounted guns. You will need to keep your eye open for upgrade components that can be merged with the core to increase your firepower. In most versions of the game, only this main component of the ship is vulnerable to enemy fire. This broad wing base doubles your firepower by upgrading your twin laser fire to quad laser fire. The downside of this upgrade is that you become a much larger target. However, if you do happen to get hit, you will only lose the current upgrades that you have attached, and not the core of the ship. So you will survive a hit and be able to continue on and collect more power ups. When you collect a second part, you can begin using your formation button. The formation button allows your components to break apart into various formations that enable entirely new weapons. With one part collected, you will break into a side-by-side formation, creating a giant wave of energy between the two components that travels upward in a huge arc. In formation mode, any part of the ship is vulnerable to enemy fire. The add-on parts will be lost if hit, but the main ship will survive. You must shoot two domes with the number 3 written on it to release this part. This tiny component that connects to your nose may look insignificant, but it is considerably useful. It does not add to your firepower ahead. Rather, it provides you with the capability of firing behind you. This will increase your ability to defend the rear of your ship so that enemies have less of a chance of ambushing you from behind. A formation with three components looks like a triangle, with the core of the ship alone and in the back. This formation substantially increases the coverage of your fire by spread five sets of twin lasers across the top of the screen. You will lose your rear firepower however, so keep that in mind when you switch to this formation. Three domes with the number 4 printed on top must be destroyed to free the fourth component. When it attaches to your nose cone, it adds a concentrated blast of energy to the middle of your laser blasts. This doesn't increase the range of your firepower but boosts the power of each fire shot: a single fire shot can destroy a full formation of enemy space craft instead of destroying a single space craft. The power shot is most useful to fight enemies showing up in vertical formations. It also destroys much more quickly tougher enemies like dinosaurs and bosses. When entering a formation with four components, they will arrange themselves in a diamond pattern, with the core taking the rear. Each component is capable of firing orbs of energy that travel in a circular pattern. When fired rapidly, few enemies will be able to find a place to hide from the orbiting motion of the orbs. The orbs radiate outward, expanding in their range until they are ultimately off the screen. In order to get this final component, you must destroy four domes that carry the number 5 on them. This last part will attach to the aft of the ship and generate a force field barrier along the rear of the ship. This barrier will not stop bullets that are fired at the rear of your ship, but it will destroy any enemy craft that fly into it. When you enter into a formation with all five components of the Winger, four of the components will arrange themselves in a square while the core remains behind them in the back. The four components will shoot diagonally inward while the core shoots upward, creating a wider spread than the formation with three components, but not necessarily one that is more powerful. In fact, strength wise, they are about the same. NES Version note: At the title screen, there is an "edit mode" which allows you to modify the position and attack direction of other components during five formation mode. If you manage to attach all four components to the core of your ship, the Winger will undergo a one time transformation, into that of a blazing Phoenix. While in this form, you are completely invincible and can destroy the enemies by crashing into them. Your firepower will be reduced to quad lasers for the duration, but that's a small price to pay for the gift of invulnerability. After enough time goes by (about the same time allotted for formations), your ship will revert back to a normal ship. You will not be able to transform into a Phoenix again until you have lost all of the components and collected them all once again. While Terra Cresta does not have stages precisely, you will encounter bosses at certain intervals along your way through the game. Each boss is considerably larger than the average enemy and takes a large number of shots to destroy. They will begin to flash once they are close to being destroyed. Boss 1: This is the easiest boss to fight. The blocks that appear on the end of the four spikes separate from the craft and launch themselves towards the Winger, and you can fire at them to destroy them. Boss 2: This boss is substantially tougher than the first boss, but it doesn't attack you nearly as frequently. Small crafts fly out from the main ship which are easily destroyed, but you must concentrate a lot of firepower on the main ship itself to bring it down. Boss 3: This final boss craft requires quite a bit of strategy to defeat. You must first shoot off the two sets of arms on either side of the main body of the ship. Then you must fire into the center until the center explodes. They continue to fire at the middle so that cockpit explodes. This page was last edited on 28 May 2014, at 08:31.